Lovage is mostly a medicinal herb, but it does have uses in the kitchen, as it tastes like celery. It is a large plant at 3-7 feet tall that looks dramatic in the garden and smells like strong celery. The leaves, stems, and seeds all taste like celery, and it can be used in place of celery in just about any dish. It has a well-rounded flavor and adds life to no-salt and low-salt dishes. The stems of Marjoram can be blanched and used as you would use asparagus or leeks. Its leaves can be used in salad, soups, and stews. It is wonderful with potatoes (especially potato salad) and goes well with steamed vegetables. 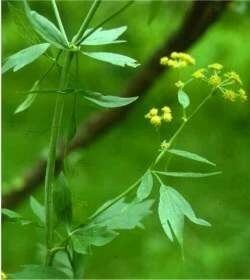 Lovage is a perennial that can be started from seed or by division. It has hollow stems that are ribbed like celery, and branches off near the top. It is fairly easy to grow, and will thrive in sun or part shade. Be sure to provide well-drained soil and a layer of mulch for the best results with Marjoram. The leaves, stems, and roots can be used fresh as needed, blanched and frozen, or dried.